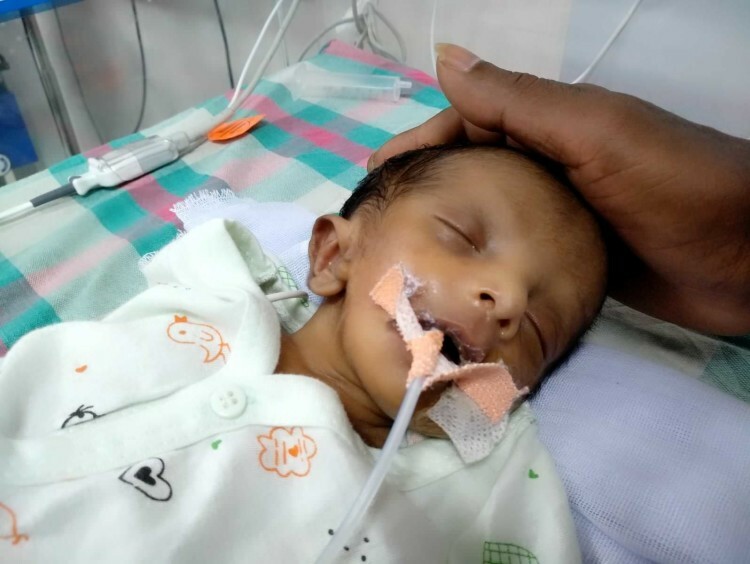 "Soon after his birth, I rushed him to Children hospital in Karaikudi. My wife was still lying unconscious. I was all alone and frozen in fear. I was terrified when I saw my baby struggling to breathe. He was in ICU for a week. They asked me to take him to the hospital in Chennai. I borrowed money from my friends and I came here. By the time we reached here, baby got infections in his blood. Fear of losing him is choking us to death but we pretend to be strong to console each other." - Arumugam. Kalaiarasi became pregnant after 2 years of marriage. Her pregnancy scans were normal. 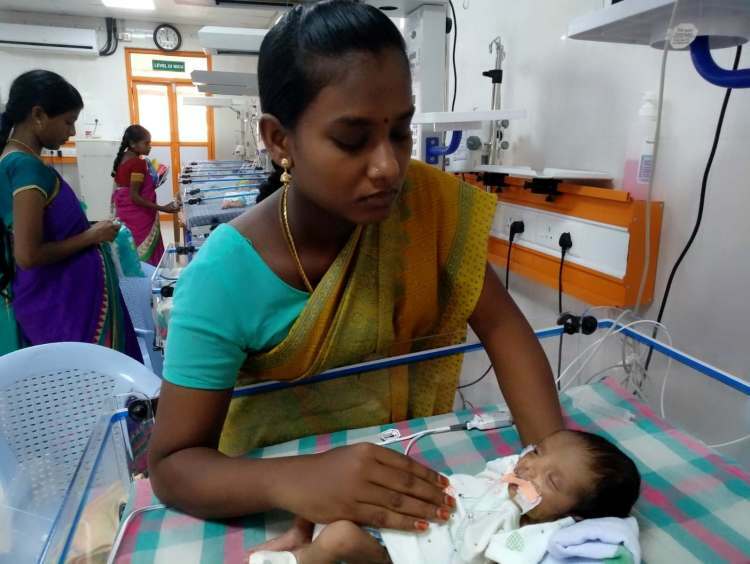 During her 9th month, just a few days before her due date, her pressure level suddenly shot up and she was sweating heavily. She was rushed to the hospital and an immediate c-section was done. 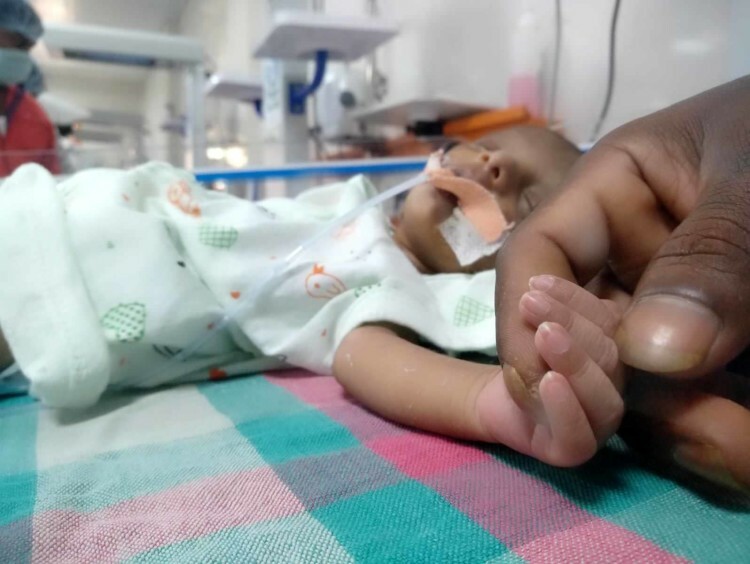 The baby was born extremely low weight, weighing only 1.7 kilos. "I never thought something drastic would happen in our lives. We don't have much yet we were happy and I had saved whatever I could to buy things for my child. Within a week I spent everything I had to save his life. My wife has not recovered from the labor but she traveled all the way to Chennai to see our son. She has not stopped crying until now." - Arumugam. 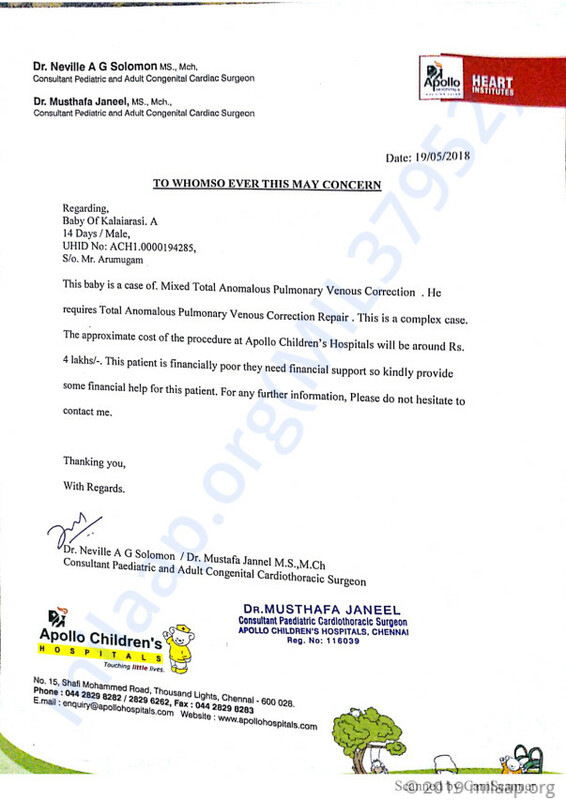 Baby has a complicated heart disease called Total Anomalous Pulmonary Venous Connection which means all four pulmonary veins are malpositioned. This condition is fatal due to abnormal blood flow. An extra sound is heard from the heart beats and the baby's skin, lips and nails have turned into blue color. 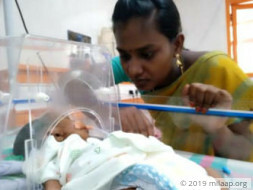 "It has been 20 days since he is born, he is still in the ICU. We have not held him in our hands even once. I have been longing to take him back home. We are staying in the hospital verandah. Whenever doctors rush into ICU, our heart skips fast. Nothing can prepare us to hear any more devastating news. They say the baby needs to gain weight and if the surgery is done, he will be recovered completely. We are glad that there is a solution, but don't know how we are going to get it done." - Kalaiarasi. Arumugam and Kalaiarasi have no one turn to help. They are exhausted. They are skipping meals to save money. Baby is now fed via tubes and needs a high dosage of medicines for the infections to heal. Kalaiarasi needs medicines to gain strength, she is very weak but they have no money for it. "I have borrowed nearly 2 lakhs and I have to pay them back. Now there is no one left to help us. It has been more than a month since I went to work. I have to start everything from scratch. 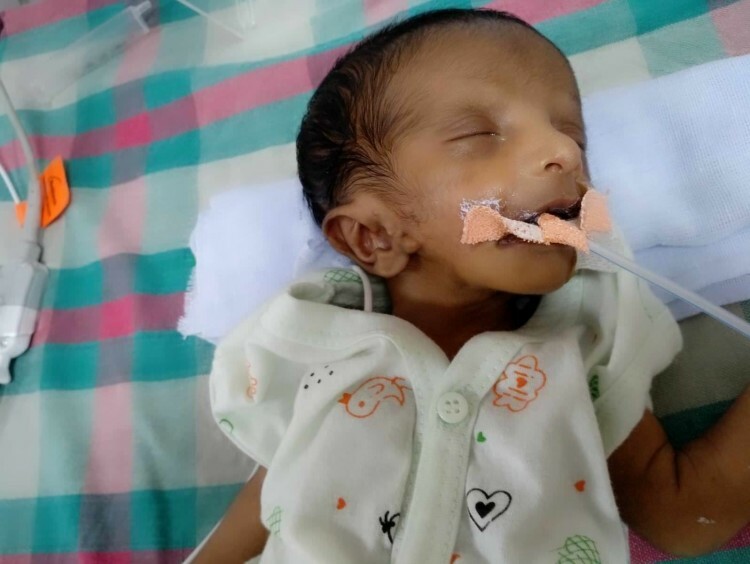 We have lost everything but we can't bear to lose our son at any cost." - Arumugam. 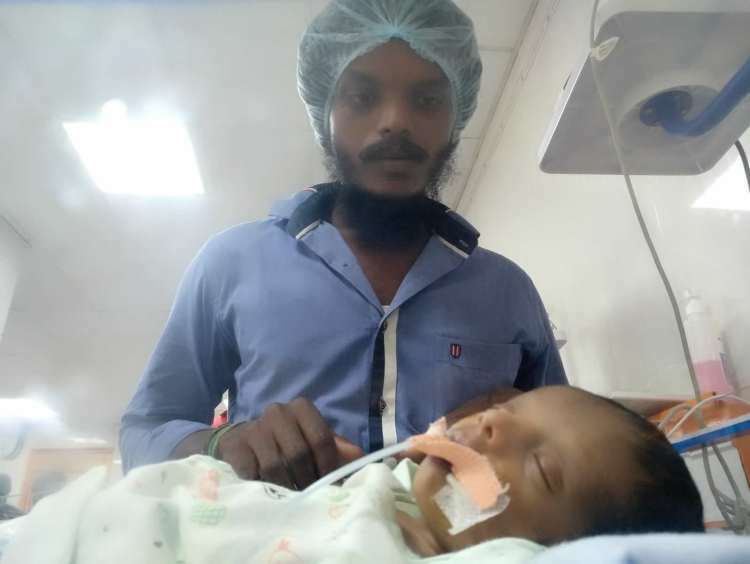 Kalaiarasi and Arumugam are desperate to save their newborn baby. Baby is battling a very serious heart condition and blood infection. An urgent surgery can save his life. He is already running out of time. Without your support, they will not be able to take their baby back home. Arumugam is a daily wage worker and earns Rs 400 per day. Now he has no source of income. Surgery costs Rs 4 lakhs which is beyond their means. May the almighty bless you. Get well soon..